Whilst Ronaldo, Rooney et al. gear up for the World Cup, in Tanzania, Burundi, Kenya, Rwanda, Somalia, South Sudan, Uganda, Zambia and Zimbabwe they are talking about the East Africa Cup. It takes place in the last week of June in Moshi, Tanzania, and is the biggest sport-for-development event of its kind in Africa. How does it compare to the World Cup? 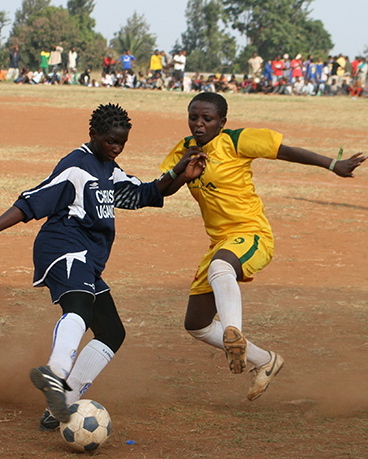 Unlike the World Cup, the East Africa Cup aims for an equal gender balance amongst its youth participants. We’ve found that sport can improve the confidence of girls and young women, and can provide a safe space where they can get together – we also believe it can challenge gender expectations and help girls and young women earn respect in their community. You con't have to wait four years for the East Africa Cup (EAC) - it happens every year, and one qualification for entrance is that the teams involved prove a year-round commitment to using sport in their community. Before a ball is kicked at the EAC all players attend classes in topics like First Aid, AIDS prevention and conflict resolution. We think that both sport and education are good for young people. The biggest trophy at the EAC doesn’t go to the team who wins the most matches; it goes to the most sporting team. As well as on-field behaviour, which is noted by the referees and their assistants, fair play can also mean off the field participation in cultural events, litter picking, and classroom activities. Some of the countries involved in the EAC have suffered terribly from conflict. At the EAC we hold workshops in conflict resolution, and we bring people together from different communities. Past participants have included former child soldiers from Uganda, and Rwandan teams which have mixed Hutu and Tutsi players, and this year there will be two teams form South Sudan. Every evening at the EAC there are songs, dances, and performances by the participating teams. We believe that by bringing youngsters together we can encourage them to think of people from neighbouring countries as friends. We don’t expect to find the next Samuel Eto’o or Didier Drogba at the EAC; but we can work with the next generation of community leaders. We have seminars on leadership and coaching. We also think that by bringing young people together in the spirit of football, fellowship and fun, and in providing opportunities for travel for players whose opportunities are limited we can help broaden the outlook of the youngsters involved. The EAC has a strong focus on child protection issues; we aim to educate both children and adults on this topic and we work closely with Save The Children to ensure that we provide a safe environment for young people. By bringing together people involved in community sport throughout the year from all over East Africa and beyond, we create an environment where people can share best practice and collaborate. So, for example, a Tanzanian trainer and from the Kicking Aids Out organisation might discuss issues with a Ugandan referee, a Kenyan coach and a Somali youth leader. The idea is that people go back to their communities with new ideas about how they can use sport in their community. We don’t make money from the East Africa Cup, and we don’t have an expensive headquarters in Geneva. In fact we are powered by volunteers, and supported by donations and payment in kind. You are welcome to support us though; our costs include catering, accommodation and transport. Either email us at info@eacup.org or find us on Facebook or Twitter @eastafricacup). The East Africa Cup is 10 years old. As we look forward to June's event, where are we going? Find out here - and join the conversation. The East africa Cup in Moshi is over for another year, and it's back to the year-round community sport and education for the teams and organisations involved. Another brilliant event, more outputs from the workshops to follow over the next few weeks - watch out for it on the EAC Facebook page . 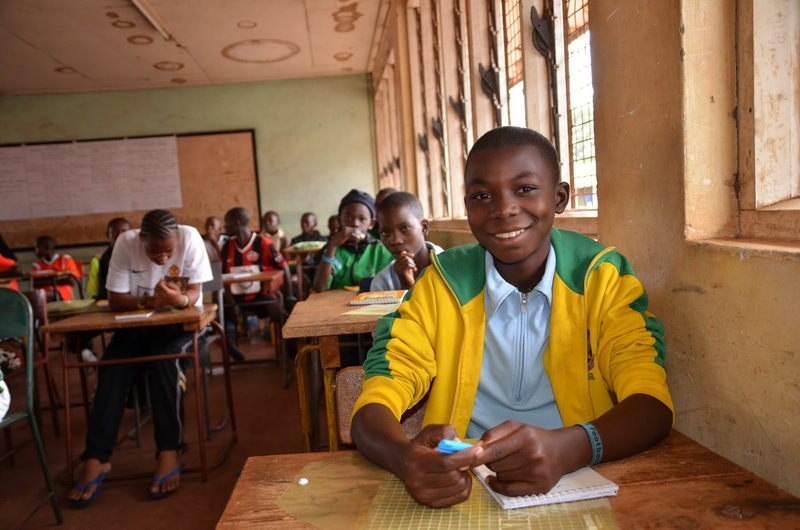 Remember to 'like' the page, and if you were involved in the EAC share your thoughts, stories and images from your 'week in Moshi' and particularly tell us about what you have been up to throughout your 'year in the community'. In other news - this is the new East Africa Cup 'first ten years' brochure - I presented a copy to Seb Coe yesterday, happy to say that he liked it. It exists to help people who might want to sponsor, fund or volunteer at the event learn something about what goes on. I've spent a lot of time over the last few years trying to ‘sell’ the idea of the East Africa Cup. What is unique about the event? Why bother? Personally I was hooked when I saw a Ugandan team made up of former child soldiers lift one of the trophies in 2009. It was one of the few times I've seen sober men tearful. But the event isn’t really about winning trophies or finding the best players. And the tournament features a whole range of young people, not just those affected by conflict. So I tend to talk about the classroom activities; young people learning about things like sports medicine, first aid and HIV and AIDS prevention is something that most people can understand as a Good Thing, even if you hated sport at school. Classes and seminars are compulsory, they happen each morning before the games start. Some of them, like interfaith dialogue, leadership skills and conflict resolution, I tend to focus on less. Not because they aren’t important, it’s just because they are much harder to explain. And some people are suspicious about workshops in these topics, and in what can be achieved in a week. 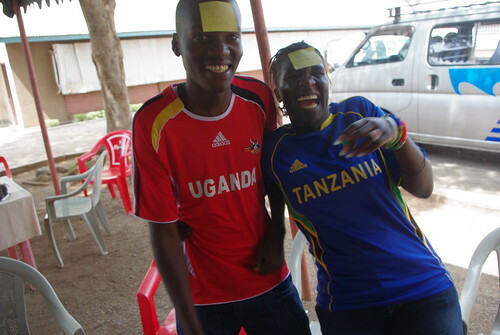 In fact, the East Africa Cup motto is ‘a week in Moshi, a year in the community’. This is because teams involved must show a year-round commitment to community sport; some pay students’ school fees, run homework clubs and put on Saturday theatre classes throughout the year. So the event is a motivation for them, as well as a time to come together and share the best ways of doing things with like-minded colleagues. I like talking about the evening programme, where young people drum, dance, sing and act in a programme of cultural exchange. The youngsters make friends from different countries, backgrounds, tribes and religions. In a region where these differences have too often been the cause of conflict, this is really important; it gives non sporty kids the chance to shine and it’s a lot of fun. These groups go out into Moshi and do street theatre too: great to see a dusty market square transformed by dancing and street theatre. There are individual success stories – like the head of the referees at the East Africa Cup who went on to become the first woman referee in the Kenyan Premier League, and the first female CAAF commissioner too, which means she makes sure that international football matches across Africa happen properly. Another youngster ran a team in Rwanda that mixed Hutus and Tutsis; he played alongside the son of the man who killed his Dad: a remarkable story given how much football divides some places. Now a young adult, this former media skills workshop attendee works in audio and video production and we’re trying to get him back to the EAC as a trainer. Much harder to explain, even though they keep me coming back, are the countless ‘East Africa Cup moments’: the clouds lifting to reveal Kilimanjaro is always special but the snakes on a minibus incident was funnier; and then there was the Year of the Wrong National Anthems… not to mention the Burundi sitting volleyball team beating able-bodied opponents to win not just a trophy but the affection of several hundred neutral fans. More than one thousand youngsters get the chance to come to Moshi, for the event, from places like Kenya, Rwanda, Burundi, Tanzania, Uganda and Zimbabwe. I’ve spoken to loads of these kids, and for most of them it’s their first time abroad; for some it’s their first time leaving the slum neighbourhood where they grew up. Quite simply, the EAC gives many of these youngsters their first ever holiday. For many of them it really is a ‘once in a lifetime’ experience. But also one that can change the course of their lives. Unfortunately we are really short of money at the East Africa Cup, and really interested in looking at how we can build partnerships that can help pay for things like healthy meals for participants, equipment, transport costs and accommodation*. * we use work with local schools who use money from the East Africa Cup money to pay for classroom repairs. The East Africa Cup is a sporting, cultural and educational gathering held annually in Moshi, Tanzania. This June (2013) the EAC will be celebrating its 10th birthday. We are looking for sponsors for the event, so we thought it was a good time to tell you about some of the reasons why we think you should get behind the East Africa Cup. Some people think that girls shouldn’t do sport. We believe the opposite. We think that it can improve the health, well being and confidence of girls. We also think that when boys and men realise that women can do sport, they can take them seriously in other arenas too. For the majority of the young participants, it’s their first experience of foreign travel. In itself this can be a great experience, especially as in some of the countries and regions in East Africa there is a history of conflict. For some youngsters, it's their first time outside of their city. People get to learn each other's songs and dances during the cultural programme, and interfaith dialogue is promoted throughout. People make friends and work together with people from other countries. In some countries, football players don't bother with school. But each morning of the East Africa Cup starts with classes in topics like conflict resolution, leadership skills and first aid. Teachers, coaches and leaders also attend masterclasses, and return to their communities with new skills. The East Africa Cup has changed many lives. One teenager at the event, who was born with HIV, explained how the Kicking Aids Out seminars affected him: "The level of naivety regarding HIV/AIDS amongst youths in my community is incredibly high. This puts the young people of my area in a very high-risk category. The information they require in most cases is not available through school or from their parents, and many young people rely on the excuse that the system has failed them; I would like to EMPOWER young people, my peers, to realise that it is both their right and responsibility to be informed about HIV and AIDS. The inspiration of [the] East Africa Cup has lead me to want to help transform youths through sports." This isn't about producing elite athletes, but of course all that running around is healthy. And through seminars in topics like first aid and AIDS prevention, young people go back to their communities with a healthier attitude. The main aim of the East Africa Cup has always been to 'empower youth through sport'. Practically this means giving them the chance to become leaders - both today and tomorrow. We don't just mean leaders on the pitch: participants have gone on to coach younger teams, organise environmental tidy up groups in their own community, and become youth leaders themselves after their time at the East Africa Cup. The EAC is powered by volunteers, most of them from East Africa itself, although we do appreciate our foreign guests who come to share the experience. If you feel like you have something to give, get in touch. People enjoy the East Africa Cup - the dancing, the video-making, the football, the street theatre. Is that a good enough reason to get involved? Nice to get another high profile endorsement for the East Africa Cup - joining rapper Emmanuel Jal and former world champion athlete Wilson Kiptiker is the Celtic and Kenya midfielder Victor Wanyama in providing a message of support for the event. He said: "The East Africa Cup is an excellent tournament which brings together young East Africans to exchange ideas and learn important life skills." There are plenty of unsung heroes at the EAC, which is about community sport and education throughout the year, rather than finding the next Premier League players. The event is powered by volunteers, and teams involved know that things like staying in school, learning about first aid and gaining leadership skills are realistic goals which can improve communities. It's great to hear that top athletes and musicians are taking notice of the EAC's work and supporting it. As I write this blog entry the closing ceremony is taking place. There's dancing both on- and off-stage, vuvuzelas, people laughing and exchanging contact details with their new friends from different countries... it feels like a festival. Its an amazing atmosphere, which is very impossible to describe, so I won't try. But as the sun sets on the ninth East Africa Cup, it's time to look forward as well as reflecting on the past achievements of this unique event. From a small football tournament with only a few hundred players and optional workshops, it has become Africa's biggest celebration of football, fellowship and education, bringing in teams from Burundi, Rwanda, Uganda, Kenya and Tanzania. What was simply a youth sport tournament has become a week-long centre of excellence for people using sport in their community throughout the year. From first aid and refereeing to film making and health education, leaders from around the region can learn skills they take back to their community. The young players themselves, more than 1300 of them don't just play football, because this isn't just a sporting event. They attend seminars in things like conflict resolution, leadership and AIDS awareness. They make friends from other countries and learn about their cultures. As well as young sportspeople, dancers and actors are a big part of the EAC. 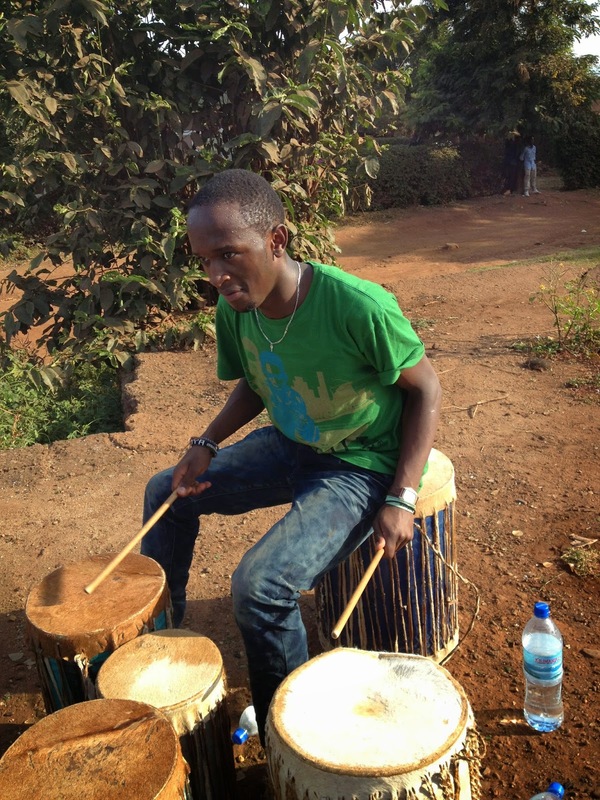 They've been playing at the closing ceremony, indeed every night; this year they also went out into the community, performing music with a message and pop up street theatre on the streets of Moshi. As ever the results of the tournament aren't who happens to score the most goals. The biggest prizes are for fair play not football prowess. Looking forward, with next year the 10th anniversary of the East Africa Cup, what next? The organisers promised some surprises at the closing press conference. But the funding challenge for the East Africa Cup is enormous, and for the event to continue to survive and thrive it needs to tell its story. Future sponsors will want to see evidence of the change in people's lives that learning trough sport can bring. We hope that you can help and thank you for your support in getting us this far.